I try to pin sewing inspiration on Pinterest, but often forget what's saved on there till I have a look. I'm glad I looked this week, because I rediscovered a wonderful street style image that inspired me to make a new favourite: the faux wrap skirt. First up I altered the side seams of the front and back skirt pieces, taking them out slightly from the hip down, so that it would be more A-line in shape, rather than pencil. I cut the length of the back skirt pieces as long as I could under the constraints my limited amount of fabric - they ended up being about 16cm longer than the front. 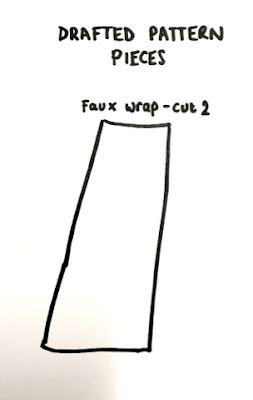 The starting point to make the faux wrap pieces was to trace the altered side seam edge of the existing front and back pattern pieces - the wrap pieces would eventually be sandwiched between the front and back skirt during construction. 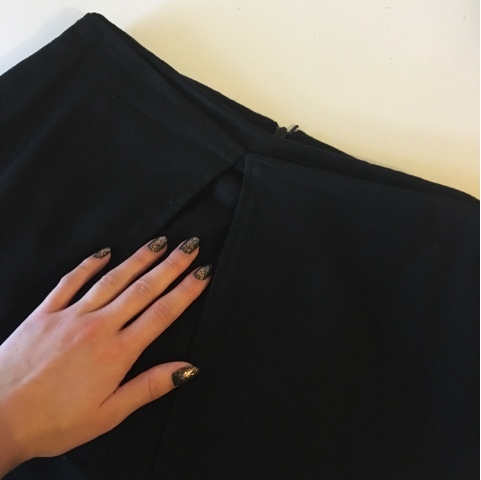 They only needed to be deep enough to meet at the CF top of the skirt, with a little bit extra added to allow room for hemming. 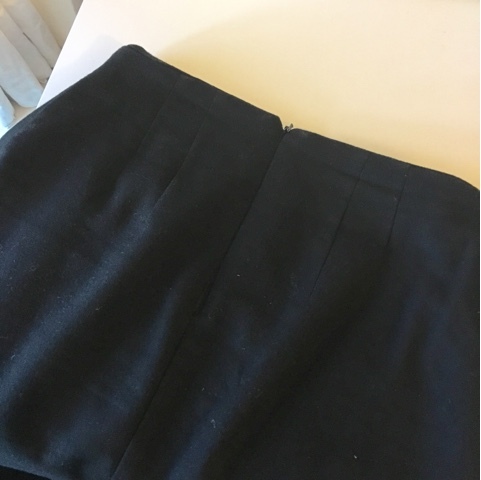 It was almost an exact copy of the back skirt pieces, (without darts) but I trimmed around 3cm from the bottom corner, diagonally to the top CF corner, to give that diagonal line where the pieces don't completely meet in the middle. And then it was pretty much a case of sewing it up as normal, with the addition of the faux wrap pieces sandwiched between the front and back skirt when sewing the side seams. 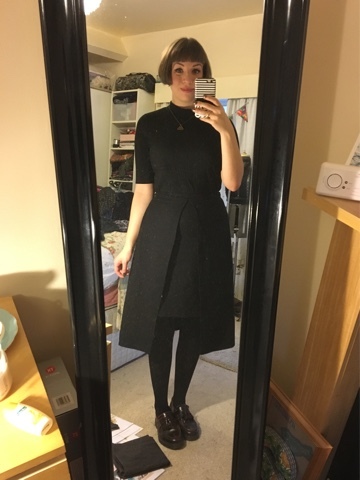 I used a black, wool-mix that I had left over from making the Mary Dress (from Famous Frocks: The Little Black Dress). 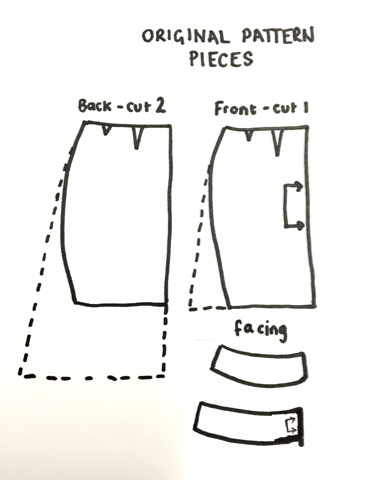 I had to carefully consider my hemming - the front skirt needed hemming before attaching to the longer back skirt/wrap pieces - and finish the wrap panels as neatly as possible in case you get a flash of the wrong side during wear.. I wasn't so sure about how to join the wrap panels in the middle - you can't really work it out from the inspiration image. I was thinking of a tie or bow at first, but the fabric is a little too thick for that. So for now, I've just tacked them in place. Does this look ok or does anyone have a better suggestion? Ideas welcome! 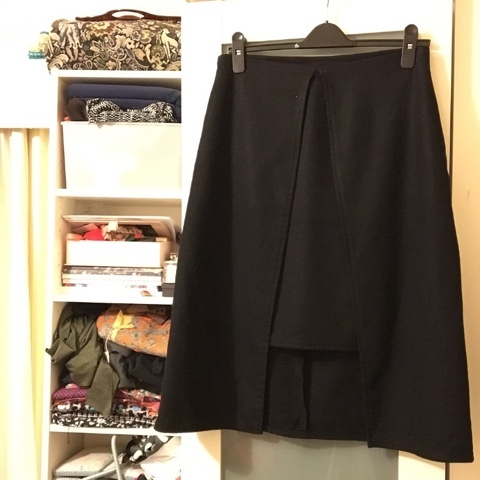 The finished skirt - it's really hard to photograph black garments! I'm so pleased that it sewed up just as I imagined in my head and on paper. It's always a nice confidence boost as a sewist when you can work things out! And I really feel like this is just the sort of garment I'd want to buy from somewhere like COS, Whistles, or Toast if funds permitted, so being able to make it myself is a real 'go me!' moment. 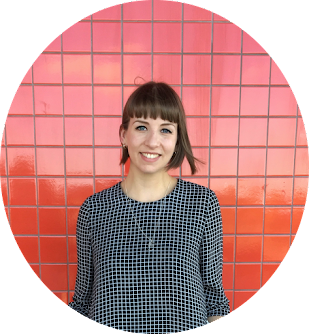 Hacking patterns isn't so scary at all and I'd encourage anyone who's not sure sure to give it a try! Finished and getting a wear! 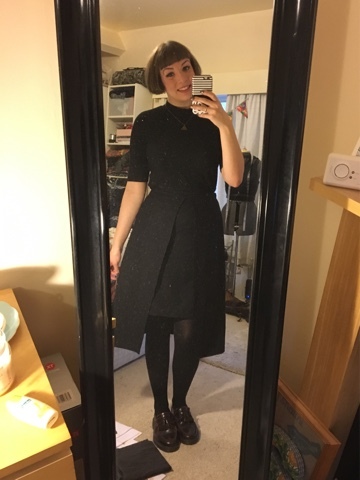 I'm going to try the skirt again but in a lightweight fabric with a good drape for summer - just booked my holidays :) - and I would consider adding a tie front to join the two panels. I'm going to keep trawling for inspiration as I really like the idea of making 'See it and Sew it' a regular thing/habit - both to blog about and to really challenge myself as a maker!